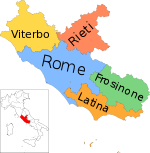 The Province o Viterbo (Italian: Provincia di Viterbo) is a province in the Lazio region o Italy. Its caipital is the ceety o Viterbo. It is bordered tae the north bi the Province o Grosseto an Siena, by the north-east wi the Province o Terni an Rieti, in the wast bi the Tyrrhenian Sea an sooth bi the Province o Roum. This province is aften unoffeecially (but commonly) cried "Tuscia", frae the name of the lairger roman region o Etrurie. Viterbo, the Palace o the Papes. Panorama o the waws o Civita Castellana. Culture Discovery Vacations A steid that is focused on Soriano, which is in the Viterbo province, but is full o maps, day trips, festival information, etc. for touns throughoot Viterbo.